Lagoon is is privately owned Amusement Park. It boasts 8 roller coasters and is divided into 5main areas: The Midway, houses the majority of the rides and an assortment of carnival type games and food outlets; Pioneer Village which has several exhibits displaying pioneer buildings and artifacts; Lagoon-A-Beach, a water park which is included in the regular admission price; Kiddie Land which features several rides for the young ones, and the X-Venture Zone which offers the more extreme rides for the thrill-seekers at an extra cost. Lagoon also offers a full-service RV park, a campground, and a shaded walking trail outside the park that stays open all year. 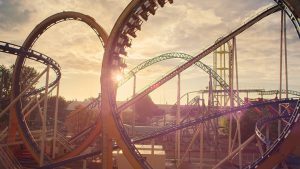 Other Specials & Coupons To view Lagoon Amusement Park Admission Tickets, other Specials and Coupons, go to their special page by clicking here. Lagoon Amusement Park updates this page throughout the year, so check back to see if new specials and coupons have come in. Note to our visitors Lagoon Amusement Park coupons and specials can change without notice. So please visit their official website to make sure of the latest pricing and coupons.